Our Christmas Holiday celebrations include bringing specific plants such as evergreens, holly, mistletoe, and in England, ivy into our homes. We send holiday card greetings, wrap presents in papers decorated with plant motifs, even sing a carol or two with the Holly and Ivy mentioned. Where do these customs come from, and what do these plants mean? In the Holly and the Ivy, botanist Barbara Segall shares with us the meanings of these plants and the beginnings of these customs. In a beautifully illustrated book with ivy garlands and holly sprigs on every page, the essence of the Yule season comes alive. For our pre-Christian ancestors there were magical qualities to the Holly and the Ivy. These two plants stayed green and bore red fruits throughout the cold, winter months. People would decorate their homes with these plants hoping to draw closer to this power and the hope of a new season of growth when all plants would once again be green. Not only the Druids, but the ancient Greeks and Romans believed in the power of these plants. Ms. Segall’s book follows the journey of these plants through the ages, and helps us discover the ‘holiday magic’ that surround them even to this day. The Holly and the Ivy is organized into six chapters. After the Introduction we explore the Christmas Magic given these plants. First the Pagans, and then continuing into the early Christian traditions the Ivy in mid-winter held special powers for discovery of one’s true love in many countries. And the Holly was used by men on St. Stephen’s Day, Dec 26, calling the day Holming Day (holm being an ancient name for holly). Yes, the Ivy had feminine connotations, and the Holly masculine. Some travelling players would perform songs focusing on the rivalry between the two sexes. The strongest men in the town of Brough, in Yorkshire, England carried a flaming holly tree through the town’s streets on Twelfth Night. By the way, the name holly does not mean holy; it derives from the Anglo Saxon name for the tree, holegn. Deck the Halls with boughs of Holly! The chapter on decorations again traces the beginnings of these traditions from Pagan times, with the Christian church slowly accepting the practice of decorating one’s home with wreaths and garlands and boughs. Combining holly and ivy made the ‘magic’ grow stronger, and most often, linked to Romance. The kissing bough or bunch usually mixed holly and ivy. It was much later that mistletoe was added to the bunch. Cards and Presents, Carols and Poems chapters trace the rich history of these two plants throughout winter holiday celebrations. The Chapter titled The Garden gives us present day information of these two plants. Did you know that there are over 400 varieties of Ivy? And even more varieties of Holly? But Botanists are still searching for the legendary white-berried English holly, described in the early 1800s, and never recorded since. The Holly and Ivy is a delightful book recording the origins of our Winter Holiday Decorations. 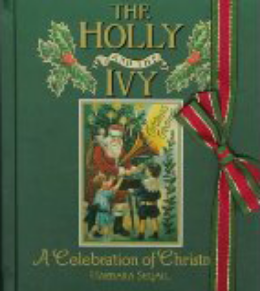 The entire book is decorated with wonderful illustrations (by Benjamin Perkins, Sally Hynard, and Anne Dyball) of cards, posters, and decorative objects, all dedicated to the glory of the Holly and the Ivy. This book is lovely to have to review every Holiday Season!